Calendar activities setup within Sentle can be accompanied by text notifications and reminders. 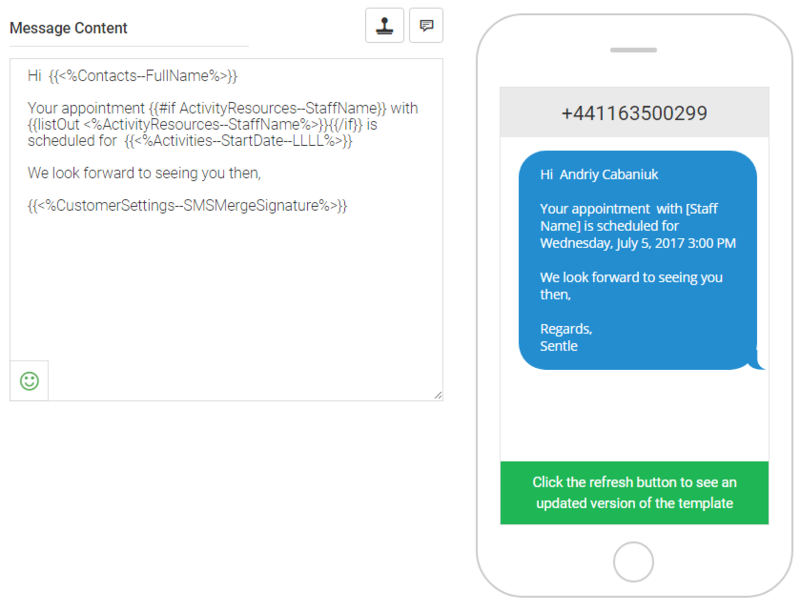 Default messages are included but to get the best of the system and personalise your communication you can set up SMS templates to assign to the various activities and message types you are sending out. Please note: These SMS templates are different to those used in the message centre for conversational SMS and communication due to the fact they rely on calendar data to ensure they have the correct information displayed. To set up a template select ‘SMS Templates’ from within the Configuration menu as displayed below. You will be presented with a single template to start with called ‘Default Sentle Reminder’. To add new template, select the green ‘add template’ button in the top right of the window. You will be presented with a blank ‘add new template’ screen that will look like that seen within the main message centre outside of the Calendar settings. From this point, you can start adding the following data. Description: In the description box, add some more notes to make it easy to understand how this message will be used. This example means that the message will include the contacts full name to ensure the message has a personal tone. We understand that these can look a little confusing so to help we’ve included sample templates to make these simple to set up. We’ll cover editing these yourself a little further down this article. From the menu select which type of message you want and press ‘Apply Sample’. In this case I’ve chosen the Appointment Reminder message. 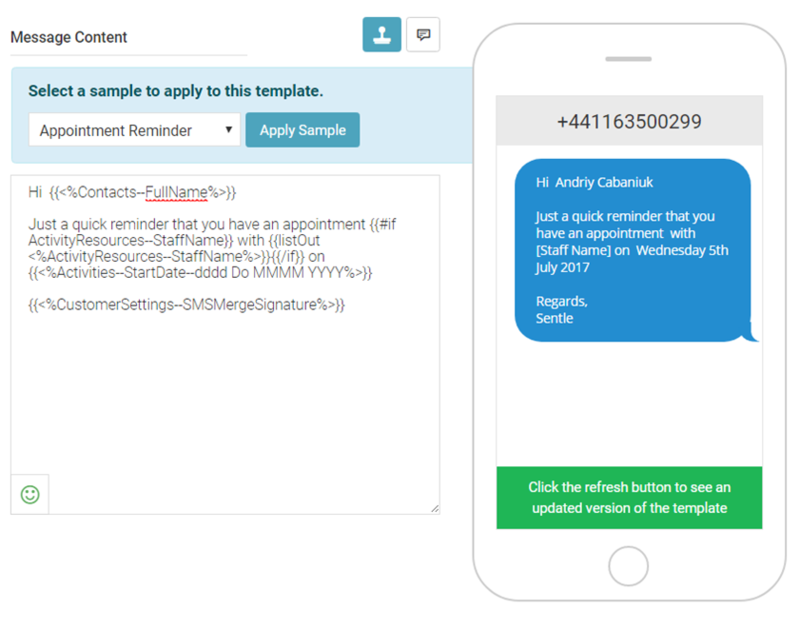 As you’ll seen, the basic template itself is full of data tags so that Sentle can do its thing automatically when sending out the automated message. So that you can see what this means to a human we’ve added the preview of the phone screen. In this example, you will see that [Staff Name] is in brackets without an actual name displayed. When this template is used against a calendar activity with a staff member assigned, their name will be displayed here. 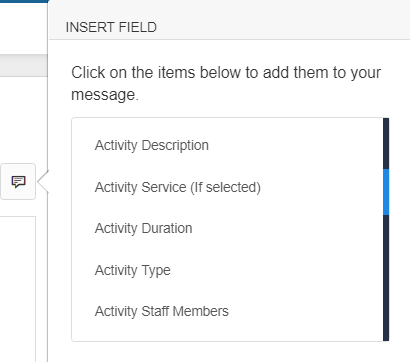 If you play around with the samples we’ve added you’ll begin to see how the data will be include when the message is assigned to an actual activity. This image below displays the message that will be used when an activity is initially scheduled. Creating your own message content. 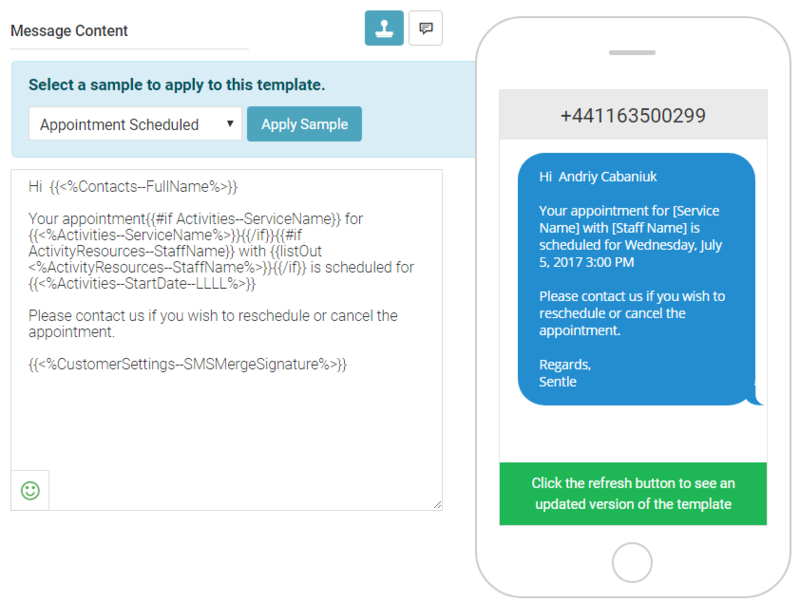 As discussed above, Sentle requires data fields to be added to message content to display the correct information from the calendar (service, date, time etc) when it automatically sends out a notification. The data fields will be displayed in scrolling menu as show here. You can now start building the message up and clicking on the green button on the phone screen to quickly preview how the message will appear and edit if required. Have a play around with the data fields and keep refreshing your image to see how the message will appear. Please note: The data fields will always be placed where your cursor is situated in the message screen when editing. Elements such ‘Regards, Sentle’ are edited within the ‘Company Settings’ area details of which can be found in this article. 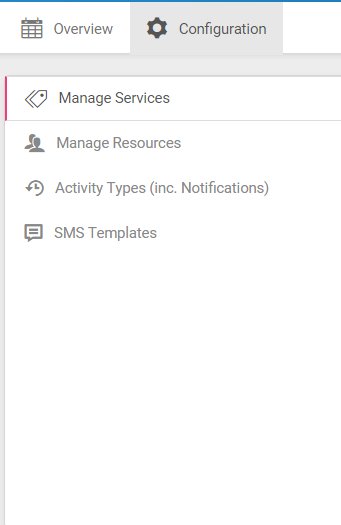 Select ‘Save Changes’ to add the template to the main SMS templates list.